From the beginning of the 20th century, the Catholic priest had become the target of bitter denunciation – not just by Protestants and atheists as one would expect – but by a growing army of Catholic liturgists, virtually all of whom were fellow priests, within the ranks of the Liturgical Movement. They further charged that since the early Middle Ages the celebrant’s role had grown so overweening that it unjustly deprived the other baptized members of the Church of full active participation in the liturgy. 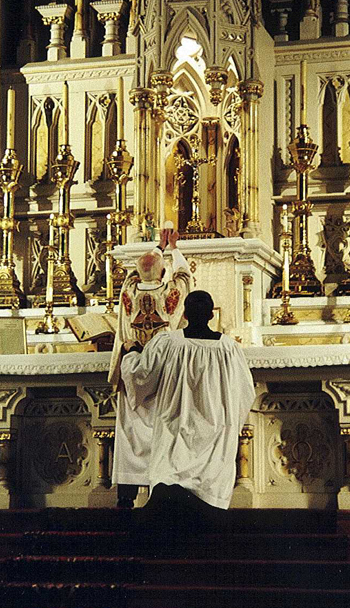 Many in the Liturgical Movement have spoken of “closing the gap between the priest and the laity” with the aim of making the whole assembly responsible for co-performing the liturgy – a camouflage for doctrinal confusion and a liturgical free-for-all. It is significant that this kind of obloquy, aimed at discrediting Tradition, was endemic only in progressivist circles, among those who despised the traditional Mass and wanted to replace it by something of their own creation. It is well-known which historical figure promoted the idea that “ownership” was “in the hands of the few” as a catalyst for revolution. But Marx’s influence was not limited to the political sphere. Henceforth the beleaguered clergy would have to defend their patch against an advancing tide of hostility from progressivist reformers in the Liturgical Movement. With Pius XII we can see the development of a new, liberal policy towards liturgical reform, the single most important element of which was to promote “active participation” of the people. The flip side of this policy, however, was to introduce legislation that effectively discriminated against the recipients of Holy Orders, making it easier for the non-ordained to usurp clerical roles. 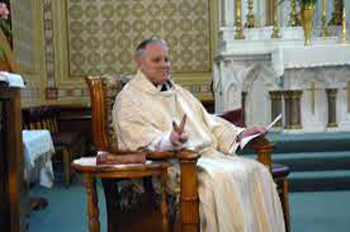 These twin objectives were, as we have seen, apparent in the rubrics of the new Order of Holy Week (1956) and the Instruction on Sacred Music (1958) which made the clergy share with the congregation their privileged worship space, liturgical roles and even their responsibility for performing the liturgy. Here we can see the flaw in the reformers’ argument, which posits a fundamental equality between clergy and laity in the liturgy by virtue of their common Baptism. They conclude from this premise that no one is superior or inferior to anyone else in the liturgy, and that any perceived differences arise purely from the variety of functions allocated to each of the participants in the assembly. Indeed, to subscribe to the view of the Catholic priesthood as nobler and loftier is to invite howls of protest from the progressivits as a violation of the rights of the laity to full “active participation” in the liturgy. So, a whole range of coercive measures were put in place, designed to protect the laity from the alleged harm inflicted on them by so-called “clericalism” and prevent the priest celebrant in particular from supposedly “lording it” over the rest of the assembly. This image goes hand in hand with the reformers’ desire to uproot and destroy the liturgy that had been handed down throughout the centuries. We have seen enough evidence to know that the new legislation was grounded in the prejudice of reformers who wanted to introduce an idea, which would revolutionize the whole of the Church’s worship – that the congregation at large had the right and duty to co-perform the liturgy with the priest. Starting on a restricted scale in Holy Week under Pope Pius XII, and continuing under his successors, increasingly stringent legislation was enacted to prevent the priest celebrant from performing many of his traditional liturgical roles. These reflected the true identity of the priest as an alter Christus and were rooted in the history, language, texts and musical heritage and culture of the Roman Rite. As preventive legislation is only used with the intention of eliminating threats to the common good – as in anti-terrorism strategies, pest control or the curtailing of infections etc. – we may reasonably infer that the traditional priesthood was similarly viewed as a danger to the success of the “new liturgical theology.” So, it too had to be eliminated along with the traditional structures that had protected the priesthood from the incursions of Protestantism and secularism. It is no coincidence that the era that comes closest to the Liturgical Movement’s ideal liturgy is the Protestant Reformation. Nor is it surprising that the priest of the Novus Ordo ended up losing his privileged status in the liturgy and becoming a mere 'presider' over the assembly’s activities. Small wonder, then, that the post-Vatican II Church is suffering from a crisis of identity among priests, and seminaries are being closed down in great number. The decline of the priesthood has already helped undermine and enfeeble the Church’s mission of salvation in the world, leaving it vulnerable to the encroachments of secular ideologies. And the more the true Mass and priesthood have been eroded, the more the Church has allowed itself to become entangled in a web of ecumenism, yielding increasing ground to false faiths and to secular ideologies, which threaten to destroy the Church’s historic identity. But where is the preventive legislation against that? See here; see also, P. Parsch, Le renouveau liturgique au service de la paroisse. Sens et portée de la liturgie populaire, Mulhouse, Salvator, translated from the German Volksliturgie. Ihr Sinn und Umfang (The People’s Liturgy. Its Meaning and Scope), Würzburg, 1940, p. 24; J. Jungmann, Mass of the Roman Rite, 1951. J. Jungmann, “Liturgy of the Eve of the Reformation,” in Worship vol.33, n. 8, 1958-1959, pp. 508, 514. Amator Liturgiae (Pseudonym), “Letter to the Editor,”, American Ecclesiastical Review, vol. 66, January 1922, p. 67. 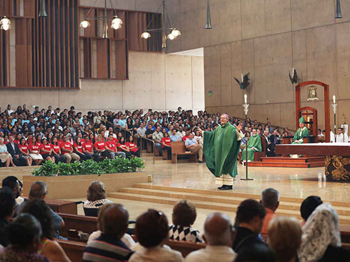 Other examples of Marxist-inspired revolution in the Church are Liberation Theology, the Worker Priests’ Movement and various lay-led organizations such as the Catholic Worker Movement, all connected with liturgical reform.